I was browsing the ‘net and found an old article I wrote for the Center for Media Freedom and Responsibility’s (CMFR) Philippine Journalism Reports. 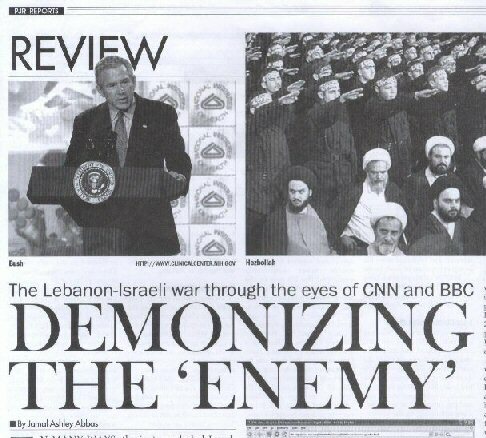 It was an analysis of the BBC and CNN coverage of the Lebanon-Israel War of 2006. As a teacher of Media Studies / Mass Communication, I know that my students and any student of Media Studies or Mass Communication can learn a lot from this article even if it was written almost a decade ago. I stayed up late several nights watching the coverage of CNN and BBC during that time. This analysis is quite important in many ways. First and foremost, I think this is the only critique of the international TV coverage of the Lebanon-Israel war done in the Philippines. As I mentioned in the Korina Sanchez show at ANC when I was invited there, the Philippine coverage of that war was quite parochial — focusing primarily on the dangers/safety of the Philippine overseas workers in the vicinity. I am posting this article here for posterity. It is still available at the CMFR website. IN MANY WAYS, the just-concluded Israel-Lebanon war was unique. It was the first war directly covered by different TV networks on the ground. While the combatants—the Israeli armed forces and the Lebanese resistance corps, Hezbollah—imposed restrictions, international journalists had access to the bombed sites, the affected civilians, and all sectors of local society. The opportunity to give more first-hand, in-depth information to the viewers was greater than ever. Because of the advances in communications technology—cell phones, digital cameras, internet, blogging, etc.—the issue for the protagonists was not how to control or refuse access, but more on how to manage information in order to mold public opinion. The United States and United Kingdom are very much allied to Israel. During the month-long war, US President George W. Bush and UK Prime Minister Tony Blair echoed whatever pronouncements the Israelis made. They also blocked the first United Nations (UN) draft resolution and adamantly refused any unconditional ceasefire. Thus, the UK-based BBC and US-based CNN could not be expected to be as fair and objective as the French or Spanish media. Their counterpart would be the Arab Al Jazeera network. But CNN and BBC are the only 24-hour news channels available in most countries, including the Philippines. The Israeli media’s target audience is the Western, non-Arab and non-Muslim peoples (especially the American and British masses) who do not know much about the Arab-Israeli conflict. For example, Israeli spokespersons call the abduction of the Israeli soldiers as the root cause of the war. But for the Arabs and Muslims, the root cause is the occupation of Palestine. When Israelis spoke to the media, it was as if the Lebanese-Israeli conflict had just started on July 12, 2006. It was only when Arabs were interviewed that viewers learned about Israel’s invasions of Lebanon twice in the past and its occupation of Lebanese territory from 1982 to 2000. Israel’s media strategy played on the ignorance of Western media personnel and audience. Fortunately, correspondents with knowledge of the region’s culture and politics like CNN’s Brent Sadler and Ben Wedeman and the BBC’s Jim Muir greatly helped not only the viewers but also the presenters in the studios to understand the whys and wherefores of the conflict. Even the parachute journalists got a better, though often shallow, understanding of what was going on by simply being there on the ground and witnessing the events for themselves. In a “post-mortem” analysis of the CNN coverage, Lawrence Pintak of the American University in Cairo attributed the apparently biased coverage to the reporters’ lack of “depth of knowledge” of the politics in the area. On the 17th day of the war, CNN’s International Correspondents program interviewed reporters covering the conflict. According to these reporters, Israelis were “easy sources” and tours were provided for journalists to visit bombed sites by Hezbollah rockets. The reporters also admitted that the Israeli media bureau beeped them for the latest announce-ments. According to one Asian correspondent, 90 percent of her news reports came from Israeli sources simply because it was more convenient for her. In one news segment, CNN’s Wolf Blitzer showed the contents of a video tape about “threats from the sea” given to him by the Israeli army. The tape was edited and not thoroughly explained. Such Israel-provided tapes were shown several times on CNN and BBC. CNN and BBC news about the conflict usually came in one batch of reports anchored by presenters. To discriminating viewers, the way the reports were framed would show the bias of the networks. For example, on July 18, one BBC sequence of reports was anchored by Jake Lynch. The first two segments were filed by James Reynolds and Gavin Hewitt, respectively. They were about the exchange of rockets and missiles by the warring parties. In the last segment, Ben Brown talked about Hezbollah weapons supplied by Iran which he said was actually fighting a proxy war. An interview with Jeremy Bowen followed where Bowen asserted that Iran seemed to be doing a proxy war. Asked about Bush’s allegation that Syria was pulling Hezbollah’s strings, Bowen replied that the Iranian president recently talked to the Syrian president and that Syria used to “rule” Lebanon. From this batch of reports, it is clear that Israel viewpoints were well represented. The first two segments equalized the strength of both parties as if World War II-vintage Katyusha rockets were anywhere near the power and capability of Israel’s satellite-guided missiles, tons of bunker-breaking bombs, cluster bombs, and continuous fire from tanks and mortars. The second segment seemed to blame Hezbollah’s rockets for Israel’s missiles devastating Lebanon. The third segment was more anti-Israel to give a seeming balance to the coverage. But in a later interview, Bowen agreed with Brown’s report that Hezbollah was doing a proxy war for Iran and even Syria. BBC was obviously contextualizing, putting the conflict within the context of Iranian regional hegemony instead of the more relevant and historical one—the Israeli occupation of Arab lands. In CNN’s daily program Larry King Live, for every three or four pro-Israeli or Jewish guests, there was one Arab or pro-Arab guest. It was only after the bombing of Qanaa when CNN and BBC viewers realized that they were seeing a sanitized version of the war. To explain the uproar in the Arab world, the correspondents had to say that what the Western/non-Arab world was seeing was nothing compared to what they were witnessing on the ground, which was what the Arab networks were broadcasting—uncut. In an interview with CNN’s Michael Holmes, Tom Fenton, former CBS correspondent said, “It’s not good that we’re sanitizing the news” because viewers don’t get a sense of what’s really going on. In Muslim demonstrations from Morocco to the Philippines that supported Lebanon, the objects of the crowd’s anger were Israel and United States. Yet media never sufficiently explained the US role in the Middle East conflict. The fact that there were American citizens fighting and dying as soldiers in the Israeli army was not considered unusual by the media. At CNN and BBC, there was constant mention of Hezbollah’s war materiel as coming from Syria and Iran. But there was no mention of America supplying Israel with military arms until Day 15 of the war when the British foreign minister announced that a US plane carrying missiles bound for Israel did not declare its cargo when it landed in the UK. This was apparently against British laws. Israeli, American, and British officials repeatedly cited UN Resolution 1559 which stipulates that armed militias be disbanded. But the resolution also demanded the withdrawal of all foreign troops, including Israeli troops in Lebanon’s Shebaa Farms. Many UN resolutions demand that Israel leave Arab lands like Syria’s Golan Heights but these were excised from any war reports or features. At the start of the conflict, CNN followed the lead of the Israeli and US governments and called Hezbollah a “terrorist group.” While the Lebanese and other Arab governments referred to Hezbollah as a “resistance movement,” the networks refused to call them as such. Stephen Sackur of BBC’s Hardtalk even wanted his guests to demonize Israel’s enemies. He pressed the Anglican bishop of Jerusalem, Rt. Rev. Riah Abu El-Assal, to condemn Hezbollah. The Christian bishop refused and answered that for 1,400 years the Muslims and Christians lived in Palestine harmoniously. He said when the Jews escaped from Europe, they even found a haven among the Arabs in Palestine. But the hard-hitting Sackur needs to be commended for engaging his guests in a no-holds-barred debate that can only result in a more enlightened audience. Herman and Chomsky’s theory explains that there are five general categories of “filters” that determine the kind of news presented in Western media. These are ownership, funding, sourcing, flak (or the unfavorable reaction of a network’s big bosses), and the anti-terror ideology, which recently replaced the anti-communist ideology. These filters ensure that Western media cannot be truly fair and objective in its news reporting. But competition from Arab and Asian networks and especially the Internet is fast challenging international news channels like CNN and BBC. The two giant networks will then have to create mechanisms that would negate Herman and Chomsky’s filters and improve their credibility while allowing them to remain profitable.